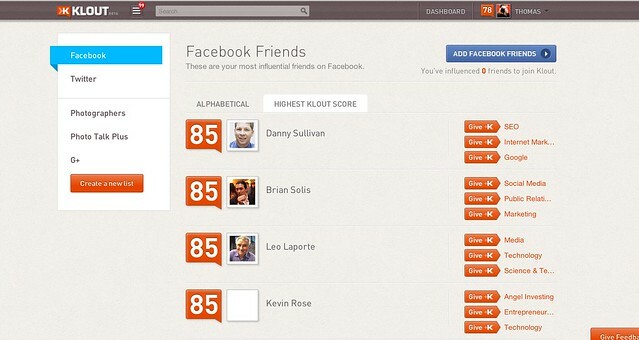 Could Klout Become a New Personalized, Cross Platform, Engagement Ranked, Relationship Weighted Media Feed? Posted on August 23, 2012, 12:20 pm, by Thomas Hawk, under Klout. Klout. Most of my friends tell me that they never check Klout, but secretly I know they all do. The website so many love to hate. Why do people hate it? Mostly because people don’t like the idea of a company presenting their value to the world based on something as superficial as popularity, even worse, *online* popularity. We are individuals, damnit, not a score on a website. People also hate the idea that they are being judged by a number from a company that gets an awful lot of things wrong about you. Stories pop up about people getting turned down for jobs because their Klout score wasn’t high enough and this makes our eyes bleed red. Most of all though, people hate the idea of Klout because it means work. 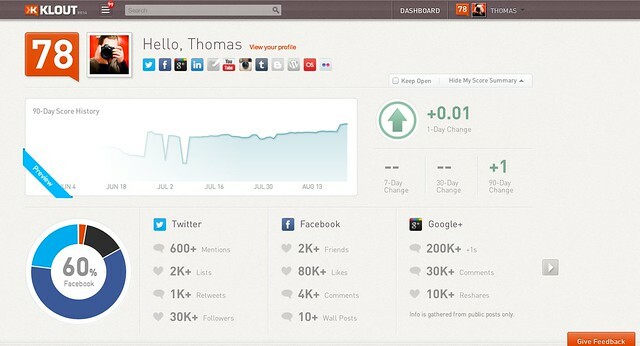 The way to get your Klout score higher is to do more work, work, work on your social media accounts. Ugh. We barely have time as it is. People complain that they can’t go on vacation because they worry about their Klout score going down if they don’t tweet enough. Lame. In the same way that folks groan when yet another social network comes along that they feel compeled to maintain, they dislike the idea that now they are going to have to put even *more* work into their existing networks in order to keep on top of yet one more thing. Especially if someone is in PR or evangelism or marketing or advertising or really promotion of any kind for a living, they worry that that Klout could affect their perceived value in the marketplace. If someone is really, really good at PR (maybe even *because* they are not wasting time on Twitter 24 hours a day) do they really deserve that low score of 32? For all these reasons Klout has a lot of haters out there. I’m not really one of the Klout haters though (even if they did recently downgrade my score from 86 to 78). I think free stuff (as long as it’s disclosed) is sort of cool. You’ll never see me say no to that free sample from the Costco lady handing out those sea salt and vinegar chips. I got a free airline ticket and a free computer from Klout. Klout gave me a Klout tshirt when I showed up at their cool SOMA offices to pick up the computer. Michael Arrington blogged that earlier this year he wrote a post titled “My Detailed Thoughts On Klout” that contained a single word in the post itself: “Why?” — but now Michael Arrington has had a change of heart and has actually invested money into Klout. I spent some time poking around the new Klout preview today and I think Arrington may be on to something. Klout still gets a lot of things wrong. It says Verizon and Sprint influence me when they don’t. It thinks I’m influential about Friendfeed, even though Facebook bought them what feels like eons ago. It bases 60% of my score on Facebook, 14% of my score on Google+ and 0% of my score based on Flickr. My Google+ account is much more active than my Facebook account and I’m pretty active on Flickr too. 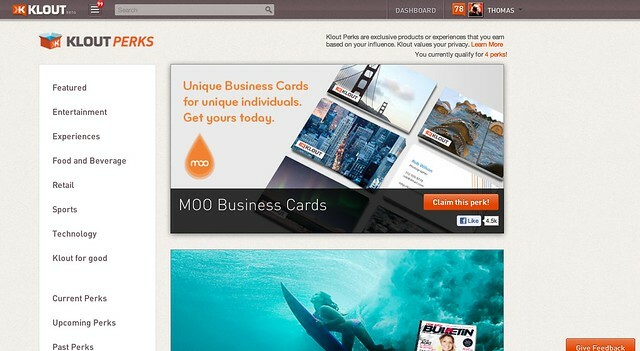 Despite these flaws I think the new Klout may be the start of something much bigger than free moo cards. I think Klout could potentially become a powerful aggregator of the most engaged and popular media published across all networks by your friends. 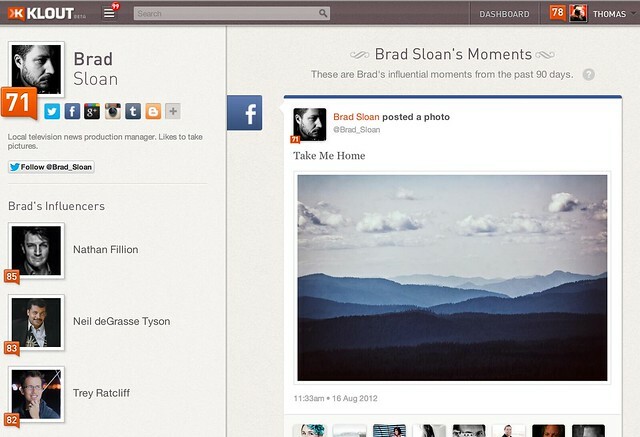 More than anything, to me the new Klout is starting to feel like a content discovery system in progress. The new Klout has a new feature called “These are your influential moments from the past 90 days.” Here Klout tries to rank my content across various networks based on engagement. In my case they don’t do a very good job across all networks, it’s mostly all Facebook stuff when I’ve had more engagement on my G+ stuff, but it’s a start. They did cherry pick out some of my most highly engaged Facebook content. Klout already knows who I follow on Twitter. They also already know who my Facebook friends are. I’ve also created a few lists on Klout which are likely some of my strongest relationships. So Klout knows a lot of the people who are important to me. They are also indexing the most engaging content by *these* folks as well on all platforms. Now, how much harder would it be for Klout to mash up all of the most popular content by all of my Facebook Friends, Flickr Friends, folks I follow on G+, people I follow on Twitter, etc. and present me a feed of the most popular content by all of these folks across all platforms in a single feed? What if… I then had a slider that I could use to set the time critera — the most engaged posts by my friends in the last 6 hours, 12 hours, 24 hours, week, month, whatever. Klout could also analyze my cross platform relationships and my frequency interaction with various contacts to further refine and rank a Facebook type algorithm for what I might want to see. There is no cross platform feed like this that exists today. Flickr has Explore where they aggregate popular content indiscriminately across all of Flickr, but it’s lame. It’s all stuff by people I don’t know and don’t care about and has tons of watermarks that I hate. What if Klout gave me a personalized version of Flickr Explore, mashed up with my facebook feed, mashed up with a personalized “what’s hot” on G+ and the most popular tweets by my friends. Klout’s new feed of my own popular content feels much more like a Facebook, G+ or Flickrstream feed than anything. Big, oversized versions of my photos and posts filtered by popularity. Klout is suddenly starting to feel a little more interesting to me. How cool would it be if, in addition to claiming my perk box of Little Debbie honey bun snack cakes, I could also stay on top of all the best content by all my friends across all networks. That would be quite the pivot if they could pull it off. A personalized, cross platform, engagement ranked and relationship weighted media feed sounds like it could fit right in with Fernandez’s description of the new Klout. Or maybe I should just lay off the crack pipe for a while.